If there was ever a time to increase funding to cancer research, this is it. A new report from the Canadian Cancer Society (CCS) predicts that almost 50 percent of Canadians will be diagnosed with cancer, and half of these (25 percent of Canadians overall) will die from the disease. This makes cancer the leading cause of death in the country. The diagnosis rate for men is 49 percent, while for women it is 45 percent. More than half of these cases are accounted for by prostate, breast, colorectal, and lung cancers. Lung cancer specifically was noted to kill more than the other three combined, and 85 percent of its cases were caused by smoking. However, pancreatic cancer is the most deadly form in terms of percentage of people killed post-prognosis, with 5,500 Canadians to be diagnosed and 4,800 of these dying. The CCS stated that “the rise in cancer cases is primarily being driven by an aging and growing population. 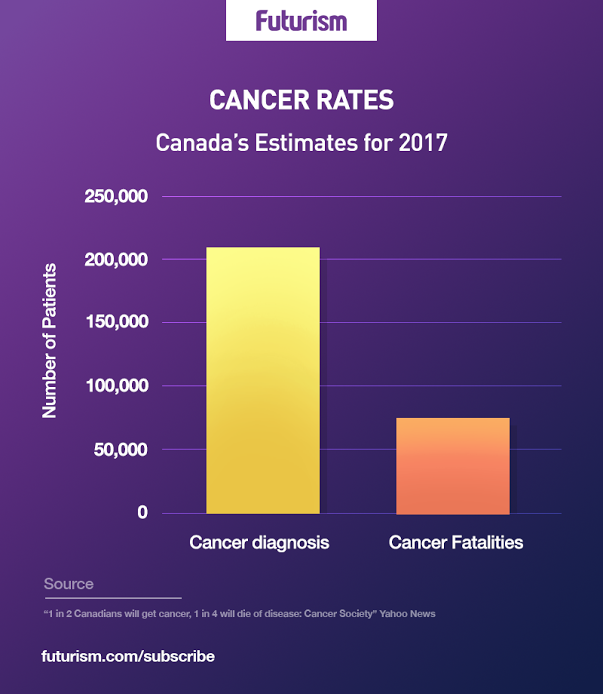 According to today’s report, an estimated 206,200 Canadians will be diagnosed with cancer this year, and almost 90 percent of these cases will be among Canadians 50 years of age and older.” While this news is shocking, it has not bucked the upward trajectory of cancer treatment in Canada: the five-year cancer death rate has decreased from 75 percent in the 1940s to 40 percent today. The research was a collaborative effort between the CCS, the Public Health Agency of Canada, Statistics Canada, and provincial and territorial cancer registries. This collaboration is crucial because it gives an objective viewpoint and provides new statistics that, according to the CCS, “are a better reflection of the risk of being diagnosed with cancer at some point in life.” Without cooperation between different branches of the civil sector, such objectivity would be impossible. The news, while tragic, serves to highlight the benefits of open information because Canadians — along with the rest of the world — can make changes to their lifestyles to lower their risk of adding to these cancer cases. It may also encourage more individuals to make appointments with doctors for possible cancer symptoms, which is vital, as early detection is one of the most powerful weapons against cancer. There are promising pieces of research worldwide that focus on cancer detection and treatment — although there could be more of these as the CCS claim that 60 percent of high-priority research goes unfunded. Pivotal work includes a new blood test, backed by Bill Gates, that can detect cancer; a possible new cancer treating drug called Pembrolizumab that has been fast-tracked by the FDA for its potential; and the development of a cancer vaccine that could inhibit cancer development in the first place.